Published on December 11, 2014 December 11, 2014 by Kristina @ Family. Work. Life. This year has been a bit of an unexpected spiritual rollercoaster for me. While I was never at a crisis point that made me ready to walk away from my faith, I will admit to becoming disillusioned with certain aspects of Christian culture. Lately it’s felt very inward-focused, exclusive, and self-serving. Add that to the general view of Christians as hateful, hypocritical, and judgmental and I started to feel like something wasn’t right. 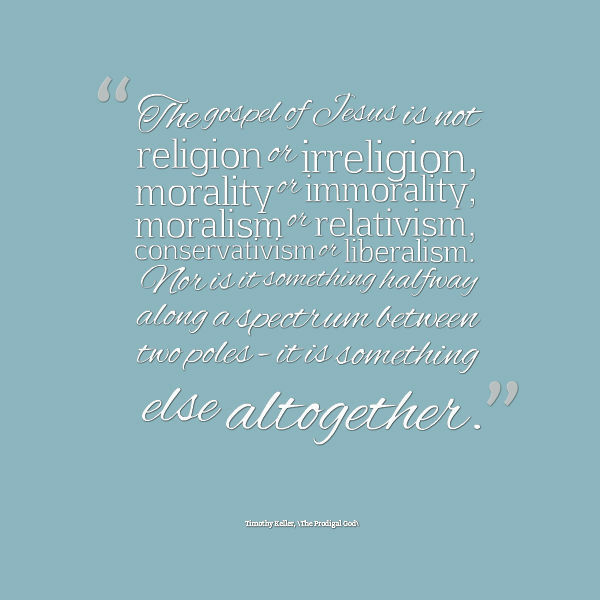 How can Christians, saved by abounding love and immeasurable grace, not be known for exuding the same to unbelievers? Let me be clear, I’m not making sweeping statements about the character of Christian people. I’m speaking specifically about the religious culture and the unfortunate reputation it’s garnered. These days it feels like so much of life is “us” vs. “them.” Differing political views, socioeconomic status, racial and cultural identity, religious affiliation. And to be honest, I’m tired of it. 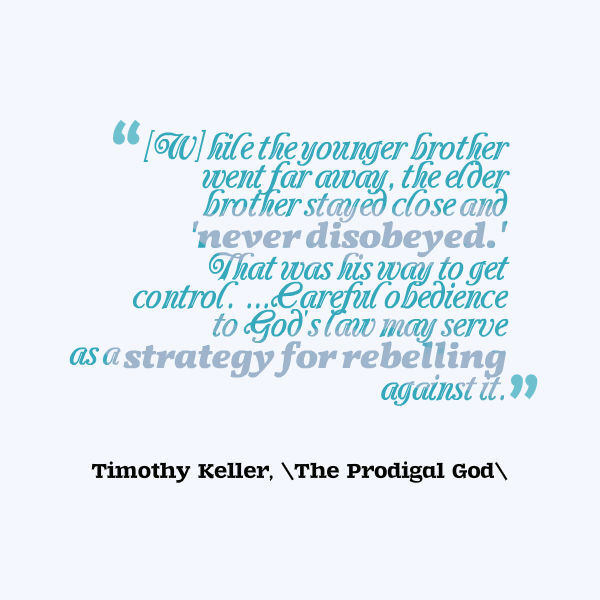 Recently our Lifegroup read through The Prodigal God by Timothy Keller; maybe it was the season I was in or the internal turmoil that made my spirit ripe for the reading, but it spoke deep to my heart. When children are in Sunday School they hear the story of the prodigal son – the good son stayed with his father and the bad son left home. When he returned, his father showed him unconditional, abundant, undeserved love and we begin to understand that this is the same love that God has for us. Then at some point as adults in church the lesson grows up and we hear that the “good” son wasn’t as great as we thought he was. He was jealous and judgmental and unforgiving. And then I read this book and realized how much richer the lesson is. How even though there’s the dichotomy between the worldly, rebellious son and the obedient, overly legalistic son, everyone identifies with one brother or the other (or even both). There were so many incredible snippets of wisdom in there I can’t even begin to adequately capture them all. One area that I found particularly profound was the discussion of motivation for obedience, and how our focus and insistence on obedience often subconsciously serves as a way for us to try and control God. Though many people reject the “prosperity gospel” teachings, when it comes down to it, many people in contemporary American Christian culture do have some level of expectation of security, provision, lifestyle, “blessing,” or general ROI as a result of obedience. 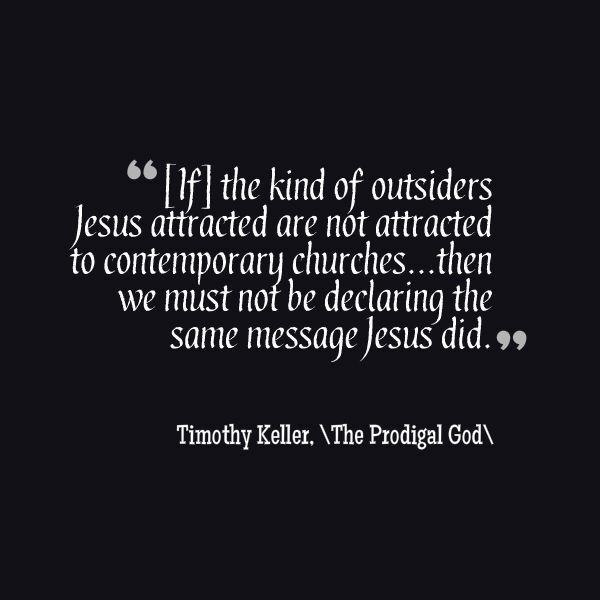 It’s not quite as overt as that in most of our minds, but Mr. Keller does a great job of leading the reader through introspection and outlines how our focus on obedience can overshadow and nudge out an authentic love for our God. This book is powerful yet simple. It’s a quick and easy read that looks at this simple Bible story in greater depth and context than ever before, revealing the beauty of God’s character, the greatness of His love, and the intense need of all people for continual grace. It’s a great read for the long-time Christian who loves the faith, the struggling believer who despairs that the Message has lost its luster, for the seeker who’s trying to figure it all out, and even the person who’s completely turned off to Christianity and finds themselves wondering why in the world are Christians so judgmental? In short, The Prodigal God is one of the most meaningful books I’ve read in a very, very long time and the subtitle Recovering the Heart of the Christian Faith is spot on. It’s thought-provoking, eye-opening, and speaks to the heart. Highly recommend!